The North Port (a.k.a. Brechin, a.k.a. Townhead) distillery lies in Brechin, on the eastern coast of Scotland. It was built in 1820 as 'Townhead' by David, John & Alexander Guthrie. However, strictly speaking it was still sort of an illegal distillery - if I understand various history books correctly, legal whisky production didn't start until 1823 when the Excise Act was passed. 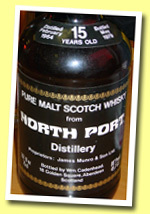 1823 was also the year that Townhead was renamed to Brechin - before the name changed to North Port .... More on Malt Madness.